Neuropsychological Testing: What Is It and When Is It Needed? As parents, it’s our inalienable right to worry. It’s just what we do. We worry about the physical health of our kids. We worry whether they’ve got the right set of friends. We worry about whether they’re keeping up in sports. We worry whether they are getting the support they need from their teachers in school. We worry whether they’re developing good habits around studying. We worry that we don’t worry enough about them. And our kids do their fair share to add to the consternation. They are practically hard-wired to give us a steady stream of reasons to worry. They are stumbling through their lives, trying to figure out who they are and how to get into a stride that works for them. So much of what they’re doing is new. Yearly, monthly, even weekly, they’re encountering new dilemmas and challenges, and they’re skinning their proverbial knees at every turn—literally sometimes and figuratively constantly. And as if this isn’t enough, to top it all off, it’s enormously challenging to have a true point of reference when it comes to rationally evaluating our children. We talk to our friends, we go to parent-teacher conferences, we ask other parents about their kids’ behavior—yet it can seem impossible to figure out whether Johnny truly has a problem, or the problem is just our incontrovertible habit of worrying. For parents, this worrying can intensify greatly when they start to suspect that their child’s problems aren’t just run-of-the-mill issues but something more serious, something that will have significant impact on their children’s lives. Perhaps they see behaviors in their children that could lead to life-long learning problems, not just hiccups in their academic semester. Maybe they’re sensing patterns that seem truly outside the norm of other kids in the same age group. One question that may arise in these situations is whether the child needs neuropsychological testing. Neuropsychology looks at relationships between the brain and behavior. When children go for neuropsychological testing, both standardized tests and observation are used, and results are compared to what is expected from that age level. Neuropsychologists also collect data about the school environment and the home environment through interviews with the parents, as well as structured questionnaires for both parents and teachers. The child was unable to remember the directions. In other words, neuropsychologists dig deeper and get more granular than teachers or even psychologists do. “A quality comprehensive assessment can sort out between these possibilities by interpreting the test results in the context of the child’s history and through close attention to how the child performs on each test. For example, does the child misread the word because he/she is being hasty—sees the word ‘party’ and immediately says ‘pretty—or is the child painstakingly trying to sound out the word and clearly doesn’t know rules of phonics? Once the testing and evaluation are complete—a process that usually requires several meetings and involves both the child and the parents—neuropsychologists will work on developing a report that explains the child’s history, his or her test results and a recommended plan of intervention. Often times, parents use this report to advocate for special services within the child’s school system. There’s also a verbal conversation with the parents to explain the findings and answer questions. Let’s face it, “neuropsychology” is a bit of a daunting word. And bringing your child in for evaluation might be a scary prospect. Seligsohn and Helmus say that part of their job is demystifying the process. While neuropsychology might conjure up images of patients on gurneys with wires attached to their heads, and doctors hovering around them measuring brain impulses, that couldn’t be further from the reality. Seligsohn points out that “in general, the tasks they’ll be doing are the kinds of things they do in school.” The word “neuropsychological” refers to the framework for interpreting the test results. So does your child truly need neuropsychological testing, or are you over-amplifying the situation in you own mind? That’s the question so many parents grapple with. She says that many parents will start with a tutor or therapist, and if the problems still persist, they’ll turn to a neuropsychologist. Helmus advises to parents to think about the cost-benefit analysis. “Having a neuropsychological evaluation requires a considerable investment of resources—time, money, and school absence. If a child is considerably behind developmentally in some sphere, the return on investment is likely to be quite high. Obviously bright but under-performing or inconsistently performing academically. Another litmus test often used for neuropsychological testing is whether a child’s overall well-being impact is being negatively impacted by cognitive, emotional or behavioral abilities. For example, Johnny flunking his 2st semester biology quiz might be a point of concern, but it isn’t affecting his overall disposition. But when Johnny hasn’t been able to score higher than a C- on a test in the last 6 months, that kind of persistent poor performance might be having a significant impact on his psyche. Johnny getting in a yelling match at gym class might sound a bit troubling, but there may have be an explanation behind it. Johnny getting into fights with kids at school several times a month is a pattern that is far more serious and might be an indicator that there are emotional regulation problems to investigate. In other words, persistent trends of negative behavior are a sign that neuropsychological testing might be in order. Discussions with a child’s school teachers is a good place to start. Tutors or therapists are often times a good next step, and often times, discussions with those various professionals can offer clarity on whether neuropsychological testing is needed. At the same time, more and more studies are showing direct links between meditation and health benefits. A study led by researchers at John Hopkins found that just eight weeks of meditation training was as effective as medication in treating depression, anxiety, and pain. At Harvard, scientists using neuro-imaging technology showed how meditation positively affected the genes and brain activity of the chronically stressed, a condition that the Benson-Henry Institute reports is related to more than 60 percent of all doctor’s visits. Schools have also begun experimenting with the practice and discovering that its techniques can help its students. When a school in New Haven, Connecticut, required yoga and meditation classes three times a week for its incoming freshman, studies found that after each class, students had significantly reduced levels of cortisol, a stress hormone, in their bodies. In San Francisco, schools that participated in Quiet Time, a Transcendental Meditation program, had twice as many students score proficient in English on the California Achievement Test than in similar schools where the program didn’t exist. Visitacion Valley Middle School specifically reduced suspensions by 45 percent during the program’s first year. Attendance rates climbed to 98 percent, grade point averages improved, and the school recorded the highest happiness levels in San Francisco on the annual California Healthy Kids Survey. Months after leaving the profession (partially due to its stress), I attended a ten-day beginner meditation retreat. It was the first time I ever attempted to learn the practice. I began to understand how powerful meditation could be in confronting the anxiety and insecurity my students felt at school and I felt while teaching, and often throughout most of my life. So, when I discovered that some of my former students had participated in a mindfulness education program called Headstand in middle school before they became my high-school students, I was eager to find out its effects." Headstand’s mission is to “empower at-risk students to combat toxic stress through yoga, mindfulness, and character education.” Harvard's Center for the Developing Child defines toxic stress as “severe, uncontrollable, chronic adversity” and explains that it can disrupt the architecture of the developing brain, often impeding academic learning and creating long-term physical- and mental-health problems. Ghannam believes her mindfulness program can serve as “an antidote to that stress” and so far, surveys results suggest the program works: 98 percent of students in the program reported feeling “less stressed” and more “ready to learn” after taking Headstand classes. Ghannam had no exposure to yoga or mindfulness growing up, and at first was skeptical it could work. Yet when the stress level during her first year teaching became overwhelming and made her begin to think her job was unsustainable, a close friend finally convinced her to take a yoga class. Ghannam believes her yoga practice gave her the skills and strength she needed to not quit teaching during that difficult first year. After practicing yoga, she felt her new sense of calm transferred to the classroom and made the environment more welcoming for her students. Years later, she decided to merge the two areas by creating Headstand. Ghannam wants to emphasize “smart practice.” When she observed existing programs, she felt they lacked a crucial element: delivery. 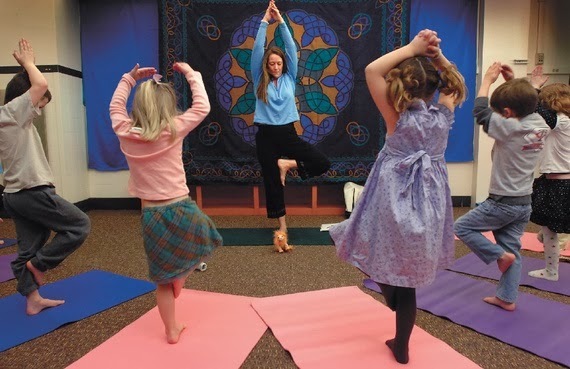 She saw many yoga instructors, accustomed to teaching in studios with middle-aged participants, not adapting their teaching strategies for children in public schools. She wondered how much greater the impact of a yoga program could be if she had academic teachers delivering the content, with a rigorous, professionally designed curriculum that made the content consistent and structured over time. Headstand employs this philosophy by only hiring yoga teachers who have three years of previous teaching experience. It also aligns its curriculum’s teaching objectives with California state standards for physical education and health. Its curriculum uses the lesson plan structure taught in several teacher training programs. Lessons scaffold skills to gradually build up to the day’s objective, starting with a “Do Now” that gets students reflecting on the day’s topic and ending class with an “exit ticket” that assesses what they learned. Even though Headstand’s mission and planning impressed me, I was still skeptical that young students could actually take yoga and mindfulness seriously. Headstand’s curriculum aims to promote this idea with its students. In one lesson plan, students brainstorm what they generally associate with the word “slow” and discuss why the word’s connotation is generally negative. Then, they do a yoga sequence paced slowly and quickly at different times, and discuss how moving at each pace affected the tone of the room, and their own frame of mind. They brainstorm situations when acting slowly may be better than acting too quickly, like during an argument or when overwhelmed on a test. While teaching, I was always concerned with “doing,” making sure my students and I constantly worked towards the goals we wanted to achieve. It wasn’t until I practiced meditation that I realized what my schools and professional environment had never taught me: that instead of moving for the sake of moving, what both my students and I may have needed instead was a moment of being still. “Their minds are busy just like ours,” says Emily Tsay, a Headstand teacher for first and second graders. “But you can see physically how their mood changes when we practice.” She says she starts class by having students rest their minds for just three breaths and then builds up from that. On a chart posted on a wall of her class, she tracks how long they can sit with their eyes closed focusing only on their breath. Headstand’s curriculum also tries to stay true to the original purpose of yoga and meditation by framing each class around positive character traits, like compassion and gratitude. Recently, some critics have coined the term "McMindfulness" to criticize the mindfulness movement’s tendency to only focus on reducing stress while ignoring the practice’s other key goals of compassion and social awareness. Critics want to ensure that programs emphasize being mindful not only for your own benefit, but for the benefit of others. This makes the character education aspect of Headstand’s curriculum significant. Each unit focuses on a certain trait. A unit on “responsibility” is framed around questions like “What does it mean to accept personal responsibility?”, “How does being irresponsible affect the people around you?” and “How are responsibility and power related?” A unit on gratitude discusses the idea of “taking something for granted.” A unit on “curiosity” asks how curiosity can encourage social justice. Headstand’s emphasis on character education follows a trend that has gained momentum in urban education circles, particularly after the popularity of journalist Paul Tough’s book How Children Succeed, based on his popular New York Times article. After dismal graduation statistics showed only nine percent of low-income students who enter a four-year college actually graduate, Tough’s book theorized that the character traits of college students, even more than their academic skills, could predict whether they succeeded or not. Headstand’s curriculum builds off of the seven traits that Tough argues are crucial for future success: grit, curiosity, self-control, social intelligence, zest, optimism, and gratitude. But with issues like funding, class scheduling, graduation requirements, and other logistics, I wondered whether programs like Headstand and others could ever become a part of our public-education system. Parents and administrators have not always embraced these programs right away. Administrators at an Ohio elementary school discontinued the school’s mindfulness program after parents felt uncomfortable with the practice’s roots in Eastern religion and complained that the program did not use class time valuably. Last year, prosecutors in a prominent court case sued California's Encinitas Union school district, arguing that the district’s yoga program indoctrinated students with Hindu beliefs. In July, the judge in the Encinitas case ruled on the side of the school district, finding that the curriculum had no trace of religion, opening up the possibility of spreading yoga to other public schools in California. But even disregarding the religious undertones of the practice, I also wondered how public school students, 48 percent of which are considered low-income and more than 40 percent of which are black and Latino, would receive a practice that is often stereotypically associated with a white, upper-class demographic. According to a 2008 study, 85 percent of yoga practitioners are white. More than 30 percent of Yoga Journal magazine’s readership have incomes over $100,000 a year. Growing up in a Latino middle-class family, I had never known anyone who practiced yoga or meditation. My father adopted “Power Yoga” in his early 60s to improve his flexibility, but he still skips the meditation part at the end of the routine. Seeing how hesitant my family has been, I doubted that students from similar backgrounds would instantly embrace Headstand classes. When I asked my former students how they perceived the program, the two students who responded—both students of color from lower-middle-class backgrounds—agreed that at first, the ideas of yoga and mindfulness were unfamiliar. Yet both Michael and Tracy eventually found Headstand’s classes beneficial. Tracy thought her teacher helped students overcome their timidity, and “won over” the majority of the class over time. Tracy ended up loving the practice so much that she wrote her college application personal statement on the effect yoga had on her life. Now a senior experiencing the stress of the college application process, Michael used the skills from the class again. He noticed how his mood changed and self-confidence dipped when worrying about completing his applications. This school year, Headstand partnered with the University of California San Francisco to provide more concrete data of the program’s effectiveness. However, Ghannam also accepts that her classes, as in Michael’s case, may not necessarily show immediate results. She is more concerned with building consistency and normalizing the practice for students over time. Practicing mindfulness now at 26, I wish I had more exposure to the practice as a student and as a teacher. I wonder whether my moment for it to “click” would have happened earlier if I had persistent classes showing me why it matters. And I wondered if practicing mindfulness as a teacher would have made me more relaxed and happy, and thus more effective. Teachers at Headstand schools seem to agree: When Tsay offered to teach an adapted version of her Headstand class for the teachers at her charter school, 12 of the 13 staff members signed up. I also wonder what it would have done for my students who also at times struggled with issues of anxiety and self-worth, and often allowed those insecurities to affect how they dealt with the everyday setbacks they encountered. As more research discovers the true effectiveness of these kids of programs, I at least take comfort in the fact that my students had the rare opportunity of learning the importance of mental health and character-building at such a young age. All students could benefit from learning these things early but with students whose backgrounds at times already place them at a disadvantage, these kinds of programs become even more justified. Every student should have access to skills necessary for confronting the anxiety of everyday life. As Tracy wrote to me: "We all deserve peace, and a calm mind." Are Your Kids Plugged Into Screens? From the Psychology Today Blog "Listen to the Kids"
How to handle your kids with screen addiction. Ten years ago, parents could simply put their child in front of a video if they wanted to get some peace in the household. You could ask them to come to dinner or suggest, “Let’s go skiing or sledding!” and chances are they’d leave the TV. Today, the screen goes with them everywhere. Children are linked up to their smartphone or tablet, or some game console activity that captivates them and keeps them in their own “zone.” They ignore you. It’s almost impossible to talk to your children today with social media, and fixation on their screens. Recently I saw several children at the mall dancing to images on a gaming console screen that was as big as a side of a house! While they were dancing, mesmerized by the sound and the colors of the digital screen, their parents were sitting by, ignoring them because they were fixated on their smart phones. Maybe that’s part of the problem. Some kids are even using their smart phones to play screen games at recess and not interacting with their peers. But some parents walk their kids in strollers, looking down at their phone. What is happening to the parent-child relationship? According to researchers, this is “the erosion of creative play and interaction with caring adults.” Studies are finally focusing on the addictive potential of computers and video games for young children and for teens. Some of the tablet and iPad apps are great for kids to improve language skills, but other apps are not educational, although they claim to be helpful. Instead, they keep a child addicted to the screen and cause parents to struggle. It’s also a problem because of what kids are missing—the social interaction and live communication that are essential for their development and for future relationships. I admit that an Xbox is fun to use! I tried skiing downhill on an Xbox yesterday with an eight-year-old. It was a real blast. Before I knew it, I was engaged with the screen and not talking to my speech patient! I was laughing at myself. Now I’m writing this blog on how to help kids avoid screen time. It’s a REAL challenge. I know. Be sure to allow time to talk and listen to them. Give them a simple plan for your day—a big list. Talk about the time of day they will be allowed to use a device and for how long. Take them outside to play! No screen time for toddlers under the age of two. Give them “options for interactive play (e.g. riding their bike with Mom) that they can do after they give up the screen time. You can try to motivate them: “When we get home from shopping, you can have ten minutes on your tablet to use two great apps: Giggly Gorillas or Toca Boca or Letter School.” However, this can be a source of argument, too. You don’t want them to think about rewards instead of doing more engaging activities. Tell them that when you’re going out for pizza or for lunch the phone or tablet will be turned off. You want to talk to them and RELATE. Give them a “goal” to look at each other now and then or to comment on someone’s actions in the restaurant. Feed them healthy snacks several times during your shopping excursion, and keep them engaged with what you’re doing (e.g. bring a stuffed animal to help shop). Help them take charge of your list of things to do; they can check things off or make choices for you. Make a clear plan and ask them what they want to do for the day. Limit screen time when you’re in the car or forbid it entirely. If your children are under age two, no screen time at all. Allow them to negotiate—more screen time at home if they cooperate and help you shop or do their chores, but no more than an hour a day on screens (all of them). Take them to a park or some place where they can run, play ball or do some kind of exercise. Take them outdoors every hour! Go sledding or walking or skiing! Walk the dog! Make projects with them. Listen to music they love when you’re in the car or at home. Participate in screen-free weeks if your town or school has one scheduled. Ask them what they want to do for the day and tell them to invite a peer. This encourages interaction instead of screen time. Give them strict instructions about screen time limits. No Angry Birds during lunch or Minecraft! Get to know these apps. Know if they have the violent part turned on or not. Some apps and games lead them only to addictive behavior. Negotiate with them about their homework. (Is it done?) Give them funds for shopping, but limit the amount. Be clear about all negotiated limits. Allow the kids to negotiate when they can use a screen and where, who will be present, and for how long. Check to be sure the games or apps are not violent. Don’t tell them what to do while they’re with peers. Compliment them for coming up with creative ideas to do things with their friends and family. Use the outdoors and take them skiing, or to an event that is interesting to them. Physical exercise is essential for high school students. Go out to dinner with your husband or wife or partner and enjoy the time together and forget the kids for an evening! Be present, relate, and enjoy your children when you’re with them. Be honest with yourself: how much time do you spend each day attached to a screen? Do you answer your phone when you’re in the presence of your kids? Be careful when you’re looking at your phone or texting while your young child is bouncing around a mall or a park. Safety for your child is first! Do what you love to do everyday. Work out, see a friend, read or just DO Nothing. The American Academy of Pediatrics stated, “It could be argued that active play is so central to child development that it should be included in the very definition of childhood.” Children need to experience learning during interactions, with creative, hand-on projects, in the outdoors, and with relationships with their teachers, caregivers and families during play.Play and relating to others is the essence of childhood. There are many resources to read about the use of technology and children. Many more studies will be in the news soon. I don’t have all the answers here, but my intuition is that we need technology, but we have to limit the amount of screen time and the quality of the games and apps that our children see everyday, even if it’s at the mall or on our own smart phones. Commonsense Media is one organization that is very helpful for parents: It provides reviews of movies, shows, games, and apps as well as recommendations. Alliance for Childhood has done some wonderful readable reports on the impact of media. Another good resource is Diane Levin's book Beyond Remote-Controlled Childhood: Teaching Young Children in the Media Age. Ann Densmore, Ed.D., CCC-SLP/A is a certified speech and language pathologist and audiologist with a doctorate in education from Clark University and a master’s degree in human development and psychology from Harvard University’s Graduate School of Education. Ann was also on the teaching faculty for Harvard Medical School/Cambridge Health Alliance Continuing Education Seminars in Psychiatry. She is the author of Helping Children with Autism Become More Social (2007), and co-author of Your Successful Preschooler: Ten Skills Children Need to Become Confident and Socially Engaged (2011). She has taught language and social communication skills to young children, nationally and internationally, for over 30 years. As an interactive map from the Council on Foreign Relations illustrates, several diseases that are easily prevented with vaccines have made a comeback in the past few years. 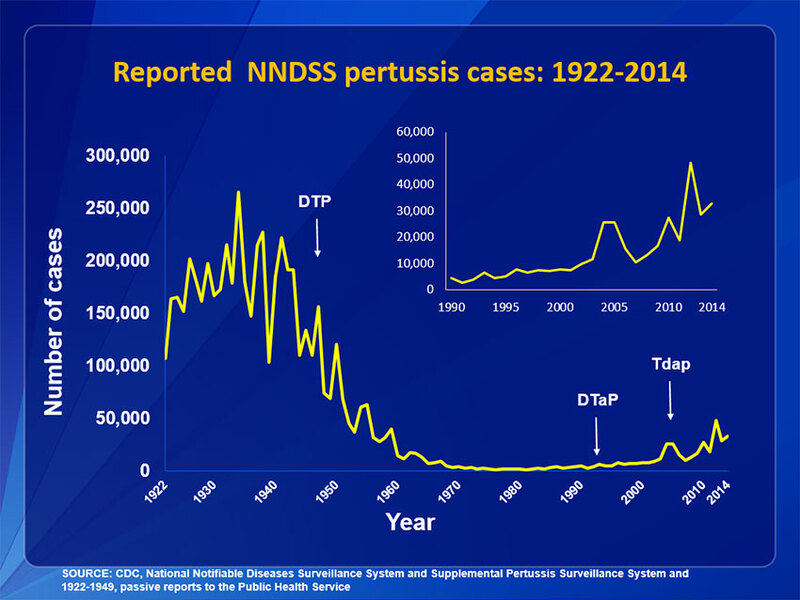 Their resurgence coincides with changes in perceptions about vaccine safety. Transitions are among the most difficult times of the day for some students with anxiety. Transitions require flexibility and executive functioning skills. In school, students must transition frequently with little support; however, transition difficulties are at the root of many non-compliance incidents. When students "don't stop reading when asked," "never follow directions" or "have to be chased to come in from recess," their noncompliance is symptomatic of a fundamental problem transitioning. We may be asking students to do something they don't have the skills to execute. Teachers can help these students with anxiety handle transitions more successfully so they don't become uncooperative. Students must make a mental shift before they transition physically. They have to stop thinking about recess and start thinking about math. Help them visualize the new activity. Take a photograph of them "ready for the next activity," or use a visual schedule so they know what's coming and can be prepared. Anxiety significantly affects the ability to initiate an anxiety-provoking activity, such as a math quiz. Any of us who have procrastinated a task we perceive as difficult can relate to this. Besides countdown transition warnings, many students need help beginning the new activity. Often, accommodations are necessary to support initiation. We can't preview enough for students with anxiety. In the morning, most teachers review a visual schedule of the day. Preview alone doesn't necessarily mitigate a student's anxiety toward a particular subject -- and definitely doesn't help them initiate the activity when it comes time. If math triggers a student's anxiety, knowing math will be at 10:30am doesn't necessarily reduce anxiety. Anticipation may even increase his anxiety all morning. As a supplement to reviewing the schedule, preview the actual piece of work. "Here's the math sheet we'll be doing today. Let's do the first problem together." When math class comes, the child has an entry point and won't have an initial avoidance response. After years of analyzing behavior microscopically, I've found it's common for students to have difficulty with the downtime during the day (e.g., standing in line, or waiting for materials to be passed out). Jessica Minahan, M.Ed., BCBA is a board-certified behavior analyst, special educator and Director of Behavioral Services at NESCA (Neuropsychology & Education Services for Children & Adolescents), as well as a school consultant to clients nationwide. She is the co-author of 'The Behavior Code: A Practical Guide to Understanding and Teaching the Most Challenging Students,' with Nancy Rappaport, M.D. (Harvard Education Press). ADHD can make it difficult for your child to concentrate and pay attention in school, but it affects more than just academics. It has an impact on social skills as well. Here are five common social challenges your child with ADHD may face—and ways you can help. Your child has trouble making friends. The ADHD link: Kids with ADHD often don’t notice how their behavior affects other people. They may interrupt others and have trouble filtering what they say—which could irritate others. How you can help: Role-play social situations with your child. He can play himself while you play the other child. Then switch. Finish by talking about what he did well and what he could do differently. Your child quickly loses friends. The ADHD link: Kids with ADHD can be very intense and demanding without realizing it. Their difficulty with taking turns and waiting for things can cause friendships to burn out. How you can help: Sign your child up for a sport or another group activity that interests him. He may find it easier to learn about “give and take” in a group setting rather than one-on-one. Your child struggles with conversation. The ADHD link: Kids with ADHD can easily lose the thread of conversation, misinterpret what others are saying and become distracted by unrelated thoughts. If your child has difficulty taking turns it can be even harder to be an equal participant. How you can help: Record a conversation with your child at mealtime. Listen to it together and talk about where you both hear him going off-topic. Discuss other ways he could have handled it. Your child overreacts to situations. The ADHD link: Kids with ADHD might struggle with self-control. They may lash out physically when they’re upset, or have meltdowns at an age when it’s no longer appropriate. Your child isn’t always reliable. The ADHD link: Kids with ADHD can have trouble with planning and follow-through. That may cause other kids to think they can’t be counted on when doing group projects. How you can help: Encourage your child to talk with the group members about how they’ll divide up the work. Then help him make a checklist or chart to keep track of his own progress. 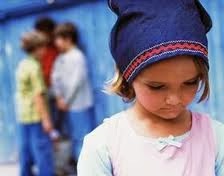 Having social issues on top of attention issues can take a toll on your child’s self-esteem. But there are many ways you can help your child build confidence, develop stronger social skills and deal with hurt feelings. Amanda Morin is an education and parenting writer who uses her experience as an early interventionist and teacher to inform her writing. Her work appears on many parenting websites and she is the author of two books, including The Everything Parent’s Guide to Special Education. But succeeding at school is not all about pure intellect, or IQ. Rather, skills of self-management, or executive functions, are the key to consistent academic achievement. Smart kids struggle in school when they don’t have tools and strategies to manage their academic demands. Here are 5 red-flag statements we hear from students that signal a need to build executive function skills. The good news? These skills can be learned. 1.) “I don’t need to write it down. I’ll remember.” Oftentimes, students think they can remember all their homework without writing it in a planner. Some days that works, but more frequently students find they have completed the wrong assignment, or they forget about it altogether. As for taking notes in class, they make the mistake of thinking that they should only write down what's new or unusual information, instead of seeing note-taking as a documentation of what was covered in class. 2.) “I hate that teacher/ that subject!” Students without good self-management skills get derailed when they don’t like a teacher or a subject. Their emotions get in the way of their investment in the class, and ultimately their grade can suffer. Successful students make 1:1 connections with all their teachers, because they know that it's in their best interests to build strong relationships with instructors. 3.) “But I know I did that assignment…” When a student doesn’t have a system for managing materials, completed homework can get lost before it ever gets passed in. Grades suffer when homework completion is spotty, even if a student does reasonably well on tests. 4.) “This work takes forever. 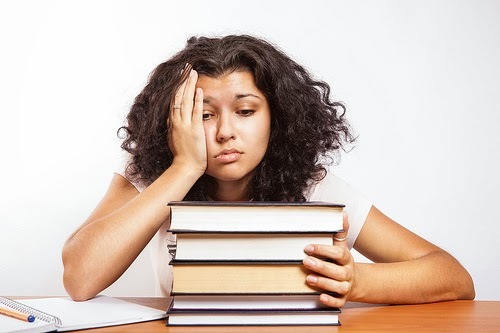 It’s so boring.” Longer, more complex assignments draw on a student’s ability to maintain their effort over time, or persist, in the midst of the temptation of other (more fun) activities. Without strategies to follow through and tolerate the “boring stuff’, students tend to give up and seek more satisfying diversions. 5.) “I’ve got plenty of time to do homework. It’s only 8:30.” Time management looms large as a critical skill for students, and for life in general. When a student has poor ability to estimate how long tasks will take, and plan his evening accordingly, the results lead to last-minute panic and sloppy or incomplete work. How many of these sound familiar to you? If you count one or more, your child may have some challenges with self-management, or executive function, skills. As with any skill, these can be learned through good instruction and practice. Ask your pediatrician or your child’s teacher about your options. Your child may be recommended for testing to determine the nature of his/her difficulties. Does your child need help managing a project? Download this free planner and start building executive function skills today, so your child can be effective for a lifetime. On February 6th at Milestones Day School, Speaker Jackie Stachel will make a presentation on executive functioning called Thinking Outside the Classroom. As the world becomes more complex and demands on students' time and attention increase, all students can benefit from strategies to manage productivity. Executive functions, the skills involved in self-management, are key elements of academic success. What sets the stage for managing executive function challenges? How do we foster growth and change? This presentation will address both the mindset and the specific tools that lead to progress in students with executive function challenges. Admission is free. Directly following, please join them for a tour of their program and complimentary lunch! RSVP to Sarah Folk, Head of Admissions, at (781) 895-3200, ext.135, or by email to sfolk@advancingmilestones.com. The controversy, such as it is, began during the Autism One conference, held in Chicago from May 23-27, 2012. The conference is a one-stop shop for parents looking for alternative treatments for autism, and it featured some of the most prominent supporters of the idea that vaccines cause autism, including discredited scientist Andrew Wakefield and celebrity autism mom Jenny McCarthy. These kinds of expansive, evidence-free claims are a sure sign of quackery, and identifying MMS as snake oil is no harder than realizing that $23 million is not waiting for you in a Nigerian bank account. Unlike some kinds of pseudoscience, though, MMS has the potential to be quite harmful. Check out the slides for Rivera's presentation, and you'll find that MMS is a combination of sodium chlorite and citric acid which, when mixed together, releases chlorine dioxide. MMS, in other words, is bleach. Rivera recommends giving it orally up to eight times a day. There's also a protocol for enemas, applied two to three times per week, and baths, which can be taken every other day. Rivera's own slides admit that MMS can cause fevers, but she calls this a "good thing" and recommends giving an enema every day during the course of a fever. She also talks about what to do if the child suffers a Herxheimer Reaction, which can cause fever, chills, hypotension, headache, hyperventilation, elevated heart rate and muscle pain. If you don't find all of that appalling enough, you can read this testimonial from the parent of a non-verbal autistic boy who is using MMS. The MMS is causing vomiting and diarrhea, but the parent is frustrated because the non-verbal boy can't give any feedback about how he's feeling. Well, how do you think he's feeling? Let's state the obvious: There is no reason to give bleach to any child, for any reason. There is not a shred of scientific evidence that MMS is an effective treatment for autism. Some purveyors of quackery have spotted a lucrative market and are trying to take advantage of it. But their protocol is far closer to child abuse than it is to effective medical treatment. Sadly, Autism One and those who attend it have had a very hard time recognizing these simple facts. In a post at Age of Autism, Julie Obradovic tries to defend MMS without actually defending it. Instead, she mentions that Autism One presenters included M.D.s, Ph.D.s, and a Nobel Laureate. But the presence of smart people at a conference that promotes quackery doesn't change the fact that it's promoting quackery. Second, Obradovic argues that Autism One "is loaded with good people, good parents, and great doctors who are willing to suffer personal attacks in order to make progress in the medical treatment of our very sick kids." Whether or not this characterization is accurate doesn't really matter. Again, the motivations of the people at Autism One are irrelevant to the subject of MMS. MMS is the worst kind of quackery, and Autism One gave it a forum. ADDitude, the magazine devoted to helping people live well with attention deficits, ended the year with a list of their top articles for 2013. Among the articles listed is Homework Help for ADHD, a topic that parents cannot get enough of. The article touts a homework system that includes helpful strategies such as getting teachers on board, establishing routines at home, and acting as your child’s “coach.” But additionally, the article contains an invaluable sidebar with tips for minimizing distractions—the real homework bugaboo for kids with ADHD. Drawing on experience from her two children with ADHD, Melinda Boring put together a list, excerpted below, of her six favorite strategies to help minimize distractions. 1. Move Around. Walking around or marching while studying helps maintain a child’s focus. Some children do better with their book in hand as they pace, using it as a reference to check information as they memorize it. 2. Speak Out Loud. Talking out loud adds auditory support to the information a child is studying. This improves recall. It is easy for ADHD students to look at a page and “read” it without focusing seriously on the material. By speaking study material aloud, the student forces his attention to stay on task. 3. Fidget. Studying at school, without the opportunity for short breaks, is unbearable for most children with ADHD. When a student can’t get up and move around, “fidget items” can provide small, controlled movements that increase attention or calm him down, as needed. 4. Change Position. Have your student use a sitting disk, instead of a chair, when he is doing written work such as an essay or filling out a study guide. This sturdy, lightweight, portable cushion fits on top of a chair seat, or it can be placed on the floor. The gentle, controlled motion of the disk satisfies a child’s need for movement without distracting him. 5. Work in Bursts. Children with ADHD struggle to maintain attention when doing activities that don’t interest them. Working intensively for short periods of time will be more productive for them. 6. Shift Subjects. “Shifting” is not multitasking: It is having a student work on a subject until his attention starts drifting. When it drifts, the student works on a different subject. A child may have to shift back and forth between assignments several times before the work is completed. Giving the ADHD student a mental break from one subject area by starting another is the key to being productive. The Wretches & Jabberers screening on opening night will be attended by its protagonists Larry Bissonnette and Tracy Thesher. They communicate via iPad, and will be answering questions afterwards. Many, many other films will be shown; most ReelAbilities screenings are free of charge. Please see the complete list of films and the full list of venues, along with the schedule for each of them. Tickets are available online as part of the listing for each film. For Opening Night (1/30), the mid-fest screening (2/3), and Closing Night (2/6), a limited number of complimentary tickets are available. Please contact Ellie Pierce by email to epierce@bjff.org before January 26th. A great new parent-to-parent advocacy resource! 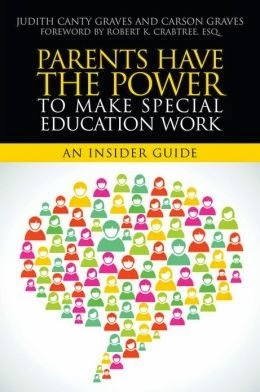 An elegantly written, wisely pragmatic new book, Parents Have the Power to Make Special Education Work (Jessica Kingsley Publishers, 2014), has been published this month to help parents navigate the special education system on behalf of their children. It was written by parents, Judith Canty Graves and Carson Graves, who learned the ropes both by advocating successfully for their own child from preschool through high school, and also by engaging extensively with many other parents and professionals along the way to learn the wider and deeper elements of the process. Their book carries the same gently persistent spirit, judicious sense of proportion, and sharp intelligence that marked their advocacy for their child, and the lessons they learned should help all parents of children with learning challenges – both those who are new to the process and those who feel frustrated and powerless after suffering multiple bureaucratic defeats along the way – avoid many common mistakes. There, I took the opportunity to survey some key developments in the history of special education advocacy and the course of legislative and judicial interpretations and modifications over the decades that, in the aggregate, now define the context for the advocacy of which the Graves have written. Buy the book HERE and 7% of the proceeds go to the Federation for Children with Special Needs. As parents you know the importance of good sleep habits for your children with learning challenges and ADHD. New findings from two recent studies have shed light on surprising factors that may be interfering with your child’s sleep patterns. In one study, University of Cincinnati researchers found that parents, peers, and the social environment had more to do with the number of hours adolescents sleep than their developmental age alone. In the second study, Education Week reported on another sleep study from Harvard Medical School that found “the use of artificial light from energy-efficient lamps and computer and mobile-electronics screens later in the day can lead to significant sleep problems” for children (and adults). “Technology has disconnected us from the natural 24-hour day,” Dr. Czeisler said in a keynote lecture at the Society for Neuroscience meeting held here last month." The National Sleep Foundation found that blue light—the type of light that interferes with sleep—is found in computers, laptops, and tablet devices used nightly or almost every night by more than half of Americans. Students exposed to blue light late in the day feel less tired and often do homework or stay online until late at night. Experts recommend nine hours per night for students from 6th to 12th grades; less than eight hours is considered insufficient. Are 20-30% of Autistic Children Recovering?